The Commons Lab of the Science and Technology Innovation Program, Woodrow Wilson International Center for Scholars, Washington, D.C.
On Monday of this week, the White House Office of the Press Secretary released an Impact Report titled “100 Examples of President Obama’s Leadership in Science, Technology, and Innovation.” Upon entering office, Obama pledged to “restore science to its rightful place,” and with less than 6 months left in his second term, the time has come to assess his commitment to that goal. This list, catalogued by the affected field, serves as tangible evidence of his reinvestment in science, technology, engineering, and math (STEM). The role of science, technology, and innovation in society cannot be overstated; with a breadth of applications – from promoting economic expansion to combatting climate change – maintaining public interest in these three domains is essential. A cornucopia of applications is on display in the report, with noted advancements and initiatives towards everything from breaking down gender stereotypes in toys and the media (#23) to safely integrating commercial drones into the national airspace (#35). Roughly the first quarter of the list is devoted to detailing the broad brush strokes of the Administration, its goals for promoting STEM within the government, the education system, and the public. And of particular note for us at the Commons Lab are the entries under the subheading “Promoting Innovation Nationwide”. It’s there that items 14 and 15 laud the establishment of the prizes and challenges platforms Challenge.gov and CitizenScience.gov. The former relies on, and monetarily rewards, the input of citizens in an effort to solve issues facing an array of government agencies. The latter comprises a catalogue, toolkit, and community page for anyone interested in joining the citizen science movement. By highlighting these platforms, especially CitizenScience.gov, which debuted in April of this year, the Administration is further fomenting its legacy of Open Innovation. The legacy is also apparent in a host of other initiatives. Obama and his team, namely staff within the Office of Science and Technology Policy (OSTP) and scholars on the President’s Council of Advisors on Science and Technology (PCAST), have worked tirelessly to foster participatory endeavors. They’ve removed certain barriers-to-entry facing the prospective innovator: they’ve made the Research & Experimentation tax credit permanent (#10), increased research and development funding (#7), and opened up nearly 200,000 Federal datasets to the public (#12). These strides, combined with those taken to cultivate future generations of STEM-savvy citizens (#16-25), have provided an optimistic trajectory for the years to come. And by recognizing and appreciating the inextricable link between innovation and entrepreneurship, this Administration has aimed to pave the way for steady economic growth; it was in this vein that a network of nine Manufacturing Innovation Institutes were established in 2012 (#30). It’s also important to note efforts to catalyze advancements in fields as diverse as healthcare (#43-46) and space exploration (#84-87). Of course, only the passage of time will allow for anyone to definitively measure the impact of the Obama White House on science, technology, and innovation, and their impacts on our nation in turn, but, according to the Office of the Press Secretary, we have at least 100 things to be thankful for. 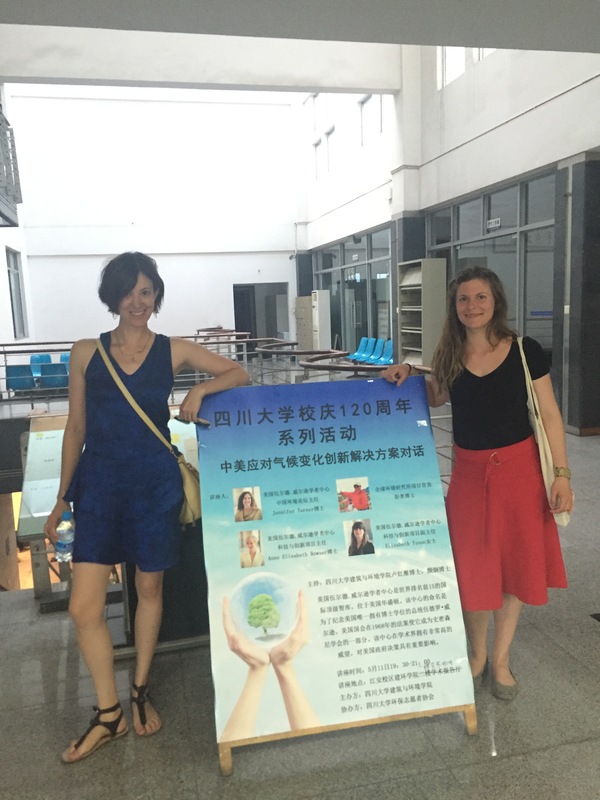 May 2016 brought the Commons Lab to Chengdu, Sichuan Provence in the People’s Republic of China. We were completing the second workshop in a series on “Storytelling is Serious Business” for environmental Chinese NGOs, supported by the Ford Foundation via the China Environment Forum at the Wilson Center. The Commons Lab presented on what types of citizen science tools, both analog and digital, are available for Chinese NGOs to use in their efforts. 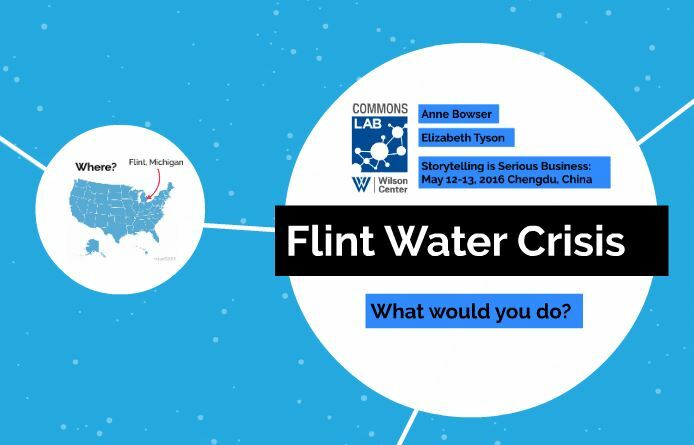 Additionally we designed and led a role playing game on the Flint Water Crisis to emphasize the importance of role and audience when engaging in complex storytelling. Participants enthusiastically embraced the game, noting a lot of similarities to Chinese environmental problems (contaminants in the water) and complex interactions between levels of government (local vs. state vs. federal). However the similarities diverged when it came to the role of the public and the the press. The participants playing the role of the Michigan State government were the most successful in which they designed a multi-faceted campaign to reach the press, locals involved, the general public and a well thought out appeal to the federal government for more money. Following this workshop the Commons Lab and the China Environment Forum presented to an eager freshman class at Sichuan University – Jiangan Campus on Choke Point China and Citizen Science 101. The students had excellent questions about citizen science concerning data quality, how to keep participants motivated (or even motivate them in the first place) and more importantly how to get involved. We shared resources from the multiple citizen science associations and since we had a few engineers in the crowd we pointed them to Public Labs resources for building your own environmental sensing devices. 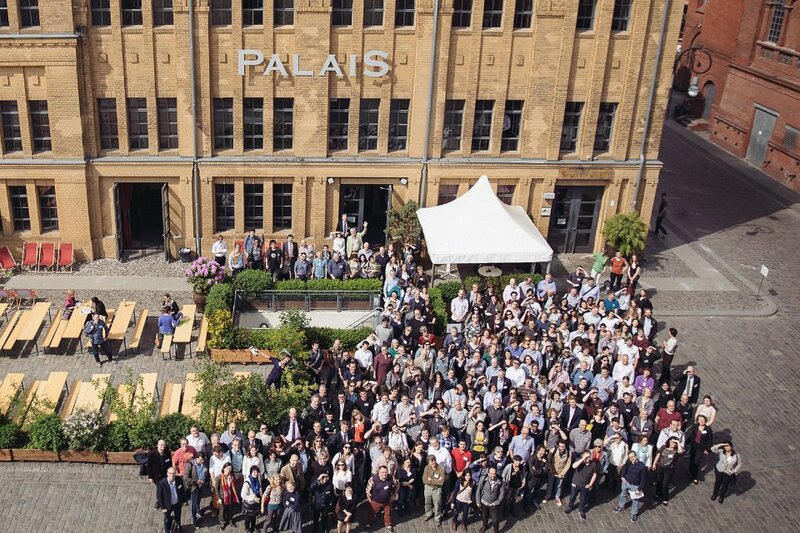 Our next stop was the first International European Citizen Science Association’s Conference which was held in Berlin, Germany. The conference theme was Citizen Science – Innovation in Open Science, Society and Policy. Over 350 people attended and the growth of the movement in Europe from previous years was palpable. The focus on policy impacts and integration of citizen science into existing governance structures was celebrated (see tweet below). International goodwill was provided among the three official associations with representatives from the US Citizen Science Association and the Australian Citizen Science Association attending. 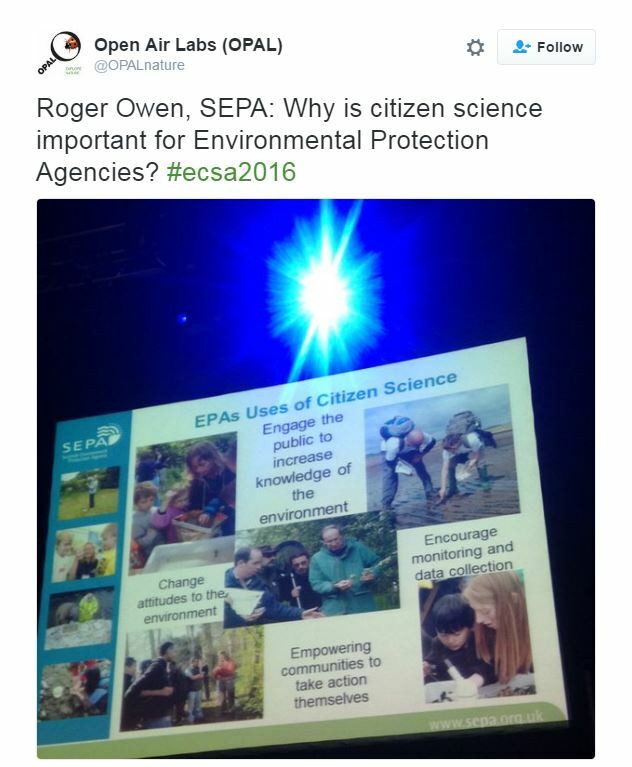 Identify clear policy leads on citizen science across the EU Directorates and within the EU Parliament to work with ECSA and to support engagement with the Eye-on-Earth Special Interest Group to shape the emerging global citizen science coalition. For results and summaries from the myriad of interesting panels please explore the conference website: http://www.ecsa2016.eu/index.html. For some wonderful photos from the conference please visit this website: http://ogarit.jalbum.net/ECSA%202016/. Of interesting note from the conference: because of the breadth and diversity of citizen science across multiple different research areas the vocabulary in this field is far from standardized. This was reflected when the conference organizers polled the audience on what percent of their job is actually dedicated to citizen science. It turns out there are only 15% of us that actual focus on the field as a whole. We look forward to seeing a similar diverse turnout with the upcoming US Citizen Science Association conference in February 2017, stay tuned for details on where and when.